Home of Dodge Lil Red Express truck owners and enthusiasts. A place for Lil Red Express truck owners to show off their trucks and non owners to find out more about Mopar trucks. Site includes featured Lil Red Express Trucks, Information, Links, Photos, screensavers and much more. Own A Dodge Lil Red Express Truck? 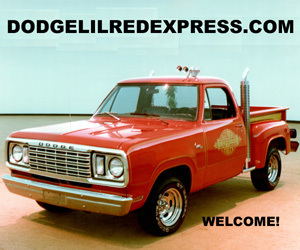 We are currently seeking Dodge Lil Red Express Trucks to feature on this site. Here is your chance to show the world your Dodge Lil Red Express Truck. We welcome all real 1978 and 1979 Dodge Lil Red Express Trucks. Click Here to have yours featured! The Dodge division of the Chrysler Corporation released the Lil Red Express Truck In 1978. One of the most unique Dodge trucks that had ever been produced. The Lil Red Express was not only a real looker but these trucks were also real performers also. In 1978 The Dodge Li’l Red Express was the fastest American made vehicle from 0 to 100 MPH as tested by Car and Driver magazine. For more information on this cool truck visit our information section.